Throw the fluffy bone again! Please!?! Pretty please?? I would be lying if I said I didn’t worry. You see, today was not an ordinary day. It was the first time we left Charlie alone all day long. I’m not on the couch. Seriously! I’m not on the couch. I imagined a hole in our couch. Teeth marks on my Mission-style furniture. A fresh pile of poop on my bed. 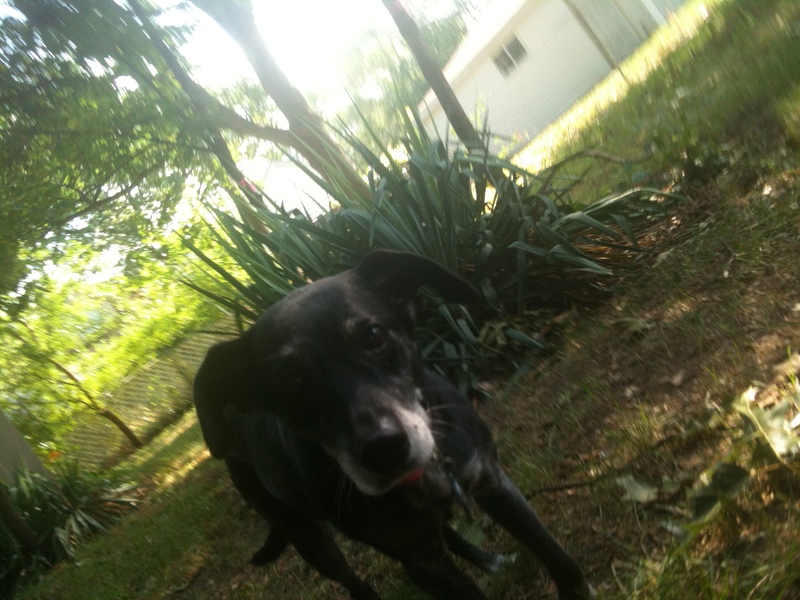 Instead, I was greeted by a wiggly Charlie, who begged/dared me to give him an “I’m home!” rub. He triumphantly waved a chewy bone in his mouth. Not a thing was disturbed. In fact, neither Lexie nor Charlie even touched a morsel of their kibble. Hmm. Impressive. We moved to the yard, so I could throw the fluffy squeaky bone to Charlie. Somehow, this is his favorite toy for fetch. It’s absolutely awkward: a stuffed bone that weighs next-to-nothing and is almost impossible to throw more than 10 feet. Still, the sight of it makes him jump up and down like … a puppy! Lex saunters at her own pace in the yard. Her wrestling days are over. We tried tennis balls, but Charlie soon lost interest. He would zoom after them, then take a sharp right turn and attempt to tackle Lexie. Now that she’s a delicate 14 years old, we were not going to allow any of those shenanigans. We quickly declared Lexie a no-fly zone, and …. Hey! What are these wood chips on the couch? And what happened to the front picture window? Are those teeth marks in the wood? What the ….??? So yes, just as I was about to present myself with the Most Awesome Puppy Owner award for Least Destruction in a Single Workday, the ceremony was quickly aborted. I couldn’t deny it, or even hide it. Charlie had chewed the front window. The good news is that this window and sill were significantly damaged many years ago by another unruly dog. And I plan on replacing the entire unit with something without teeth marks (and more energy efficient) in the next year or so. The problem is that for the next week, with Matt out of town, I have no way of correcting his behavior. I could hope really hard that he just won’t find the front window tasty anymore. Scientifically, I think that’s my best bet. In fact, right now I’m closing my eyes and thinking NO EATING THE FRONT WINDOW! and amazingly, Charlie has not left his bed. 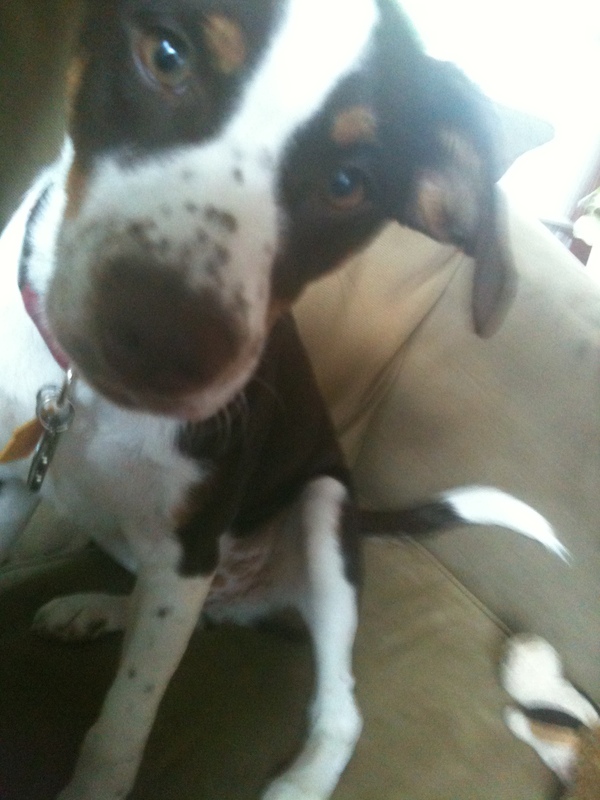 This entry was posted in Woof! 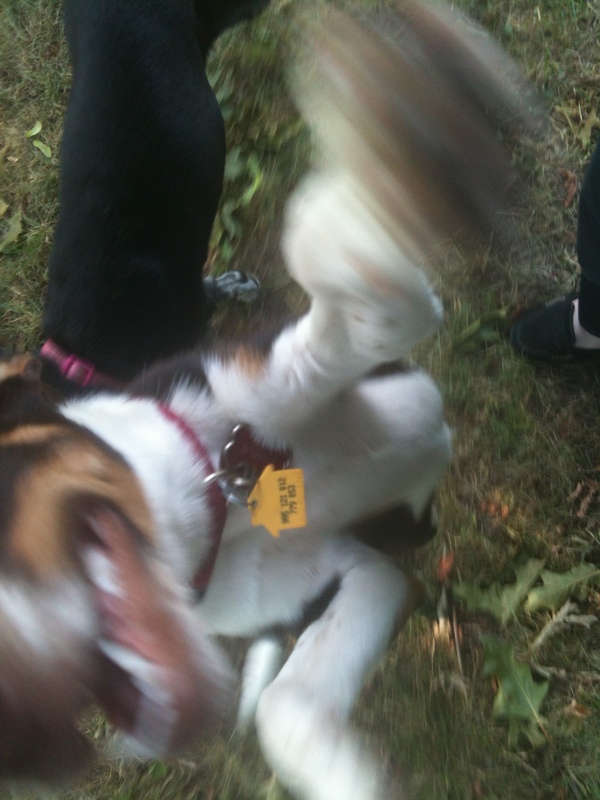 and tagged adopt, border collie, destruction, dogs, pets, puppy, rescue, toys by ourfureverfamily. Bookmark the permalink. Doggy ate part of the first step of the stairs, I was not happy but then if I had decided between replacing and step or the leather sofa, the coffee table or even the TV, I’ll replace all the steps monthly. I’m not fan at all of experiencing things with dogs, but I tried something while I was at home so I could control it, I put vinegar on the step he was chewing and a little pepper, a salad almost, he smelled and try to chew, he hated it, never went back. I won’t tell you it was that, cuz it may have been the milk bone I bought the day after that kept him entertained, but it was a coincidence. Hi! 🙂 Thanks for sharing your story. And yes, he’s teething. 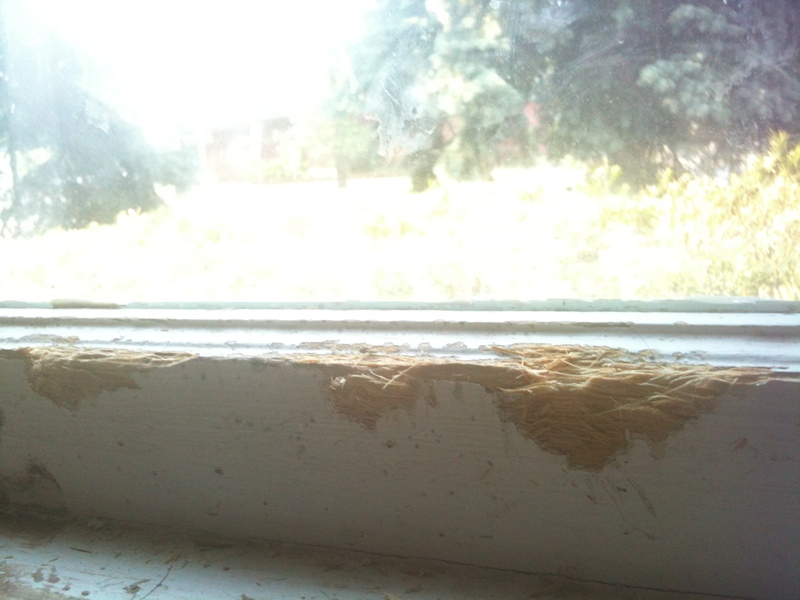 Especially since I plan on replacing this window anyway, I’m considering a pepper or lemon spray for the surface. It certainly won’t damage the wood any more than already happened. Sorry.. didn’t realize I was posting anonymous! !